SORRY. EVENT IS SOLD OUT. 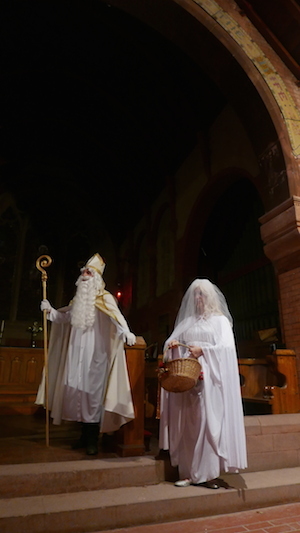 Tonight’s event will be staged amid the candles and stained glass of the historic CHURCH OF THE ANGELS, an exquisite Gothic Revival edifice built in 1889. 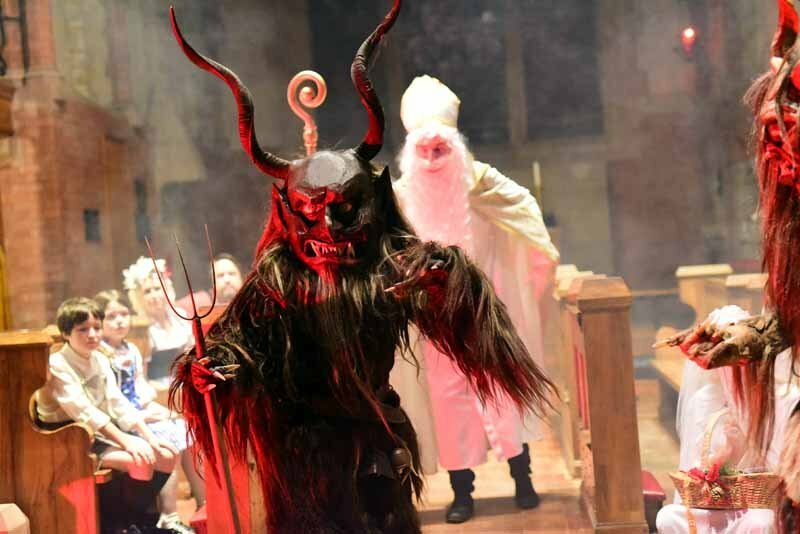 Here you’ll encounter the Krampus in his purest form — the wily devil of the centuries-old Alpine “Nikolausspiel” or NICHOLAS PLAY, a folk theater genre dating back to the 18th century and resembling England’s Christmas mummers’ plays. The Nicholas Play is a primary origin of the Krampus tradition, and for tonight’s presentation, we’ve translated scenes from surviving German scripts to give you a taste of how the Krampus was experienced in Alpine villages of centuries gone by. Our Los Angeles production combines only the most attractive and amusing scenes involving the Krampus, Lucifer, butchered children, and the inexorable power of Death, all represented in bouncy rhyme. Whether speaking of eternal salvation or the merciless tortures of Hell, the dialogue of the Nikolausspiel is inevitably delivered in cheery couplets worthy of Dr. Seuss. Preceding the play,we’re presenting a preview featurette of Krampus documentary,TUIFL (“Devil”). Filmmaker HANNAH JAKUBOWSkA will be in town to introduce the film. Traditional songs and stories of the season will be performed by MICHAEL & MONIKA KAUFMANN, siblings traveling here from Gai bei Trofaiach in the Styrian state of Austria to share their holiday customs. Styrian musician JOHANNES TEICHERT will accompany them on flugelhorn. 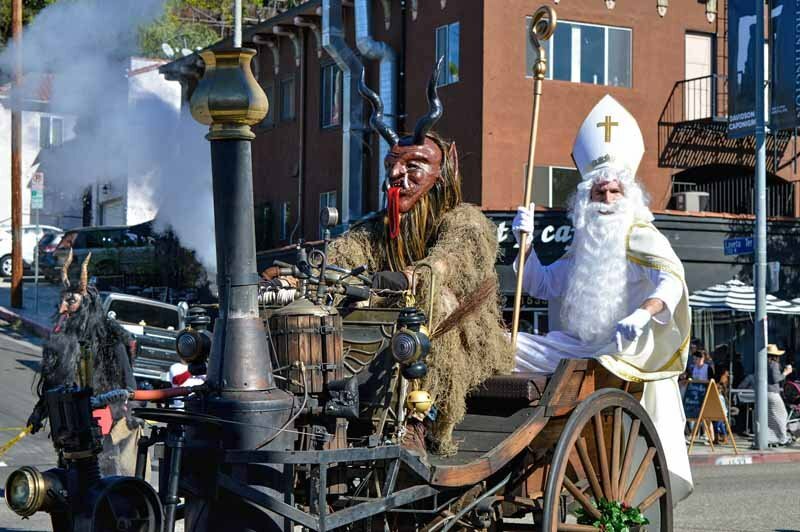 Also helping to transport you to 19th-century Europe will be Bay Area artist KIMRIC SMYTHE’S KRAMPUS-DRIVEN STEAMCAR, which will be parked outside before and after shows for photos with the Krampuses and cast members. Bay Area accordionist JD LIMELIGHT will also be on hand to keep it Alpine. Guests are are invited to come in themed wardrobe, period clothing, or holiday attire, festive or grim.